Use mouse to select menu. Shortcuts are present on some menus. Upgradable equipment lets you improve weapons and armor. Fishing minigame allows you to catch the fish that can increase the performance of the character. 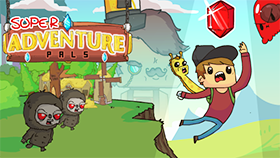 Are you looking for an adventure game? Do you want to become a hero and save the world? So why not try joining the game Crystal Story 2 Unblocked now at Freegames66.com. Let's experience the game and save the world right now.